Your search for potter wright and webb returned the following results. Every time I look at the Historypin website, the number of channels has increased, with many museums and archives across the world having their own Historypin channel. I’ve had a quick look at some of them, and most seem to be plotting their photographic collections, which is how Historypin was intended to be used. Here at MERL, however, we’re trying to plot out object collections. Danielle explained some of the issues in doing this in her previous post – particularly those relating to the fact that objects are often associated with multiple places. However, there is a third approach to Historypin that I wanted to write about today, as it sprang both from the work we’re doing here at MERL and a post I wrote a while ago about mapping craft. I have mentioned the Potter, Wright and Webb blog before, which looks at traditional regional crafts in the UK. Rachel has written posts on swill basketmaking in Cumbria, sanquhar knitting in Dumfriesshire, Orkney chairs in the Orkney Islands and bodging in Buckinghamshire. When I wrote about mapping craft, I mentioned that I would really like to see the traditional crafts of the UK plotted on a map, and this is exactly what the Potter, Wright and Webb Historypin channel which Rachel set up is attempting to do. (Also have a look at Rachel’s blog post about it here). While other museums are looking to plot where a particular photograph was taken on a map (and also position the photo on street view to enable fading in and out), and while MERL is trying to plot where a particular object was made, used and acquired, Rachel is taking a completely different approach. Instead of looking at the particular, she is looking at the general – at typologies of objects rather than individual objects. 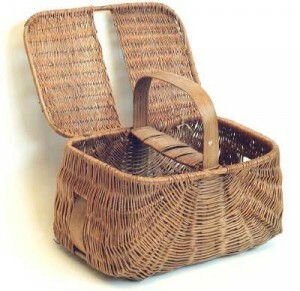 Let’s take the example of a Southport boat basket, a basket designed originally for marketing butter and eggs. This is one of the few baskets for which there is a known inventor and date. It was designed in 1830 by Mr Cobham of Mawdesley, Lancashire, and the manufacture was developed by Thomas Cowley, a local basketmaking firm. However, because the design of a basket cannot be patented, the Southport boat has been copied all over the world. We have eight of them in the collection at MERL. We would pin each of these separately to Historypin – pinning each to the place(s) where it was made, used and collected, and would have a separate photo of each basket. Rachel, on the other hand, would have one photograph (which needn’t be any specific Southport boat, just a Southport boat) and would pin it generally to Southport/Lancashire. This approach could be used for all sorts of things. For example, billhooks, wagons and ploughs are often regional in design, and the typology of each could be pinned to that place. 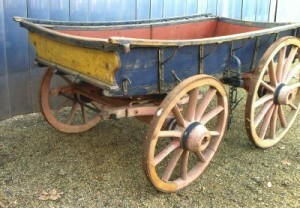 So, on Rachel’s map a generic ‘Dorset wagon’ would be pinned to Dorset, whereas on the MERL map a specific Dorset wagon would be pinned to the places(s) it was made, used and acquired (in the case of wagon 61/43 at MERL, that would be Bridport and Broadoak in Dorset (where it was made) and Newhouse Farm in Broadoak (where it was acquired)). Likewise, a generic ‘Sussex billhook’ would be pinned to Sussex on Rachel’s map, whereas on the MERL map a specific Sussex billhook we be pinned to the places(s) it was made, used and acquired (in the case of billhook 54/704 that would be Birmingham (where it was made) and Camden (where it was acquired)). Rachel is only in the early stages of using Historypin for this purpose and there are still many things to consider, such as whether she is plotting historic traditional regional crafts, or those that survive today, or both. It’s necessary to have a date to pin something to Historypin, and it’s possibly to filter by date so these functions could help tackle this issue. Another question is how to deal with crafts such as blacksmithing which occur everywhere. 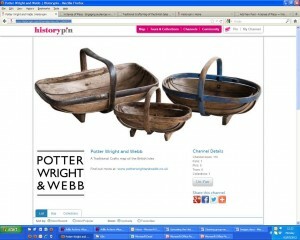 Cumbrian swill basket as pinned on Potter, Wright and Webb's Historypin channel. Even though there are still things to think about, I think this is a great way to use Historypin, and there is potential for cross over with the work we’re doing at MERL, especially when plotting our craft collections. And what’s really good to know is that people are reading our blog, and that it is inspiring them to do similar things. We’d be really interested to hear from any museum already mapping its object collections, or looking to do something similar! 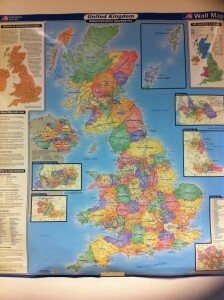 Our office decoration - complete with counties and unitary authorities. 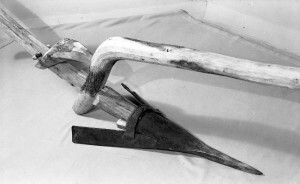 MERL has a sizeable collection of rural craft objects, both finished items and the tools needed to make them. The craft collections are one of the things that first attracted me to the Museum, and my first visit to MERL was to interview the former Keeper, Roy Brigden, about craft and intangible heritage in museums for my Museum Studies dissertation (ultimately I wrote it about craft as intangible heritage in the UK). This means that I’m always on the look out to do things at MERL connected with the craft collections. Here in the Sense of Place project office we’re using the word ‘mapping’ quite a lot. Work is being carried out on Adlib this afternoon, which means no cataloguing, so I thought it would be a good opportunity to write a post about mapping – and will do so in the context of craft. It’s a bit of a stream-of-consciousness post so apologies if it jumps from here to there! Our project is called ‘A Sense of Place’ – it clearly has something to do with places, with geography. As you’re no doubt aware, we’re enhancing the Museum’s catalogue with information about place – where the objects in the collection were made, used and collected – so that we can ultimately plot them on a map. This will enable us to ‘see’ where our objects have come from. This forms part of the work we’re doing with Historypin and trialling in Bucklebury, Berkshire. Plotting our collections in this way will not only provide visitors with new ways to search the collections but will also enable us, the Museum, to see the geographical spread of our objects and identify places from which we have many/few/no objects. This also has the potential to feed into MERL’s acquisitions and disposals policies – we may want to acquire objects from areas in England that aren’t currently very well represented, or we may question why we have objects from other countries (such as an Israeli ard) when we are the Museum of English Rural Life. MERL's Israeli ard (61/3/1-3). Incidentally, this is one of the 60 series of black and white negatives that are being scanned by a team of volunteers for the JISC digitisation project that Felicity and I are also working on. Although we tend to think of mapping (and maps) in a geographical context, it isn’t all about plotting places on maps and connecting things/ideas to places. Mapping has different meanings in different fields (this is where I now struggle to explain them, but you can see that they’re not to do with geography/maps in the conventional sense). In computer programming you can ‘map’ drives and software so that you can have access to them from different places, in maths ‘mapping’ is another word for ‘function’, you can ‘map out’ or plan your future and you can make something well known or ‘put it on the map’. 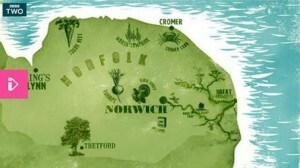 It’s not all about geography. In my life outside MERL, I’m a trustee of the Heritage Crafts Association (HCA), the advocacy body for traditional heritage crafts. It aims to support and promote traditional crafts as a fundamental part of our living heritage in the UK and ensure that those craft skills are carried on into the future. As part of my work for the HCA I sit on the steering group of a ‘mapping’ project commissioned by the Department of Business, Innovation and Skills and run by Creative and Cultural Skills. This piece of research seeks to ‘map’ the occupations, skills and economic contribution of the heritage craft sector in England. So this project is about gaining a deeper understanding, building a better a picture, understanding the size/shape/form/spread etc. rather than looking at craft in terms of place or in a geographical sense. I do hope, however, that the final report will include some regional analysis so that we can understand how the craft sector differs across the country. Back to more conventional ‘mapping’, I really would like to see the traditional crafts of the UK plotted on a map. The HCA does have a craft map showing where traditional craftspeople are across the country, but I’d like a map to show the multitude of crafts which are strongly tied to particular areas, be it saddle making in Walsall, shoe making in Northampton, cutlery in Sheffield, willow basket making in Somerset, straw plaiting and hat making in Bedfordshire, chair bodging in High Wycombe etc. – the list goes on. There’s a good blog about regional crafts here. This relationship between place and craft has developed for all sorts of reasons – the materials available, the natural landscape, the ways of living, the development of industry – and understanding where something comes from is key to understanding why that thing is the way it is. This is not only true of the crafts, but is also true of other groups of objects we have at MERL, such as ploughs and wagons, the design of which is informed by the type of soil and the terrain of the areas in which they were used. 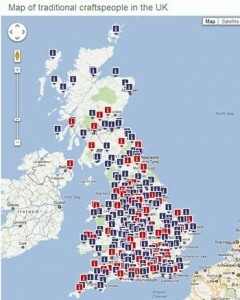 I feel that the UK is quite behind in making that link between craft and place. Last summer I went to Japan for a few weeks (having studied Japanese at university and visited several times) with the idea of travelling around and looking at traditional crafts as I went. I did start to blog about it, and would definitely like to see more in the future. Japan has been preserving its intangible cultural heritage since the 1950s and they really look after their traditional crafts, with an Association for the Promotion of Traditional Craft Industries, a Centre for Traditional Crafts (renamed Japan Traditional Crafts Aoyama Square), a Folk Crafts Museum, craft museums in most prefectures, a Living National Treasures scheme etc. I started my journey with a visit to the Centre for Traditional Crafts in Tokyo and picked up a fantastic map of Japan with all of the regional crafts plotted on it. It was the first time I’d seen anything like it and I thought it was brilliant. Once you start to know where a craft comes from, you can begin to understand why it developed there. I recently saw something similar on the BBC’s ‘Our Food’ programme which plotted local foods on a map of the UK, and the programme explored the relationship between place and food. Maps like these can really help us start to think about things in new ways – by ‘seeing’ that relationship with place represented on a map, we realise that relationship exists and can begin to understand and explore it. In my spare time (there doesn’t seem to be much of it left) I’ve started compiling a list so that I can create one of these maps myself – any contributions are very welcome! 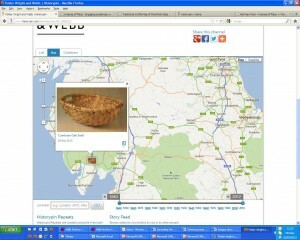 And in my work time, I’m hoping to explore that relationship with place in the basket collections. The Team has now divvied up some of the different strands of the Sense of Place project and we are moving our focus away from chronological cataloguing to concentrate on testing various uses for the enhanced catalogue. In our chronological cataloguing, I’m part way through 1955 while Felicity is working on 1956, and we do hope to make it out of the 1950s by the end of the year. Danielle will be concentrating on our work with Bucklebury History Group and Historypin, while Felicity will look at the use of QR codes and augmented reality as ways of accessing information about the displays in the Museum. I’m a bit more of a technophobe and am going to be looking at using the ‘exhibitions tool’ on Adlib, which will hopefully allow us to pull out information from our enhanced catalogue records to produce an online exhibition. I’m hoping to put together an exhibition on regional baskets as I’m quite a fan – I used baskets as a case study craft for my dissertation. I think MERL has about 425 baskets in the collection. My plan is to catalogue them, map them in the traditional geographic sense so that I can see where they’ve all come from), and then explore the relationship between the baskets and those places. This is still very much in the pipeline but I’m really excited about it! I will, of course, continue to contribute to the Bucklebury efforts. And I haven’t forgotten that I still need to blog about the Massingham Collection that was part of my 1951 cataloguing. I want to find out a bit more about Massingham before I attempt to write anything so his book, ‘Country Relics’, is on my (ever-growing) reading list.